A mosaic is an ancient technique that dates back to 3,000 B.C. Initially it was used as an architectural barrier, later as pavement, and then evolved into an aesthetic decoration made of colored, specially cut tiles. Artists from all eras have used this technique, where individual exploration of the art form has led to extraordinary results. However, this form of art is still an unusual practice, undoubtedly due to the complexity of execution. Among contemporary artists, there are a few who have managed to re-interpret this ancient technique. In his way, Tom Fruin is one of them. While not a mosaic artist per se, he references the art form in a distinctive way, pulling mosaics away from the static, two-dimensional realm and combining it with other forms of art like sewing, collage, and public installations. Fruin’s inspiration was born from the streets. His first works date back to the nineties, having recently moved from Los Angeles to New York’s Lower East Side. This neighborhood, which is now a coveted and popular part of the city, was considered rough and gritty at the time. The streets were full of garbage and littered with colored plastic bags used to encase drugs of all kinds. There were so many of these small bags that Fruin began collecting them, gathering a sufficient number to create his first quilt, a traditional American art form associated with concepts of family, human warmth, and home—contradictions to the use of drugs. 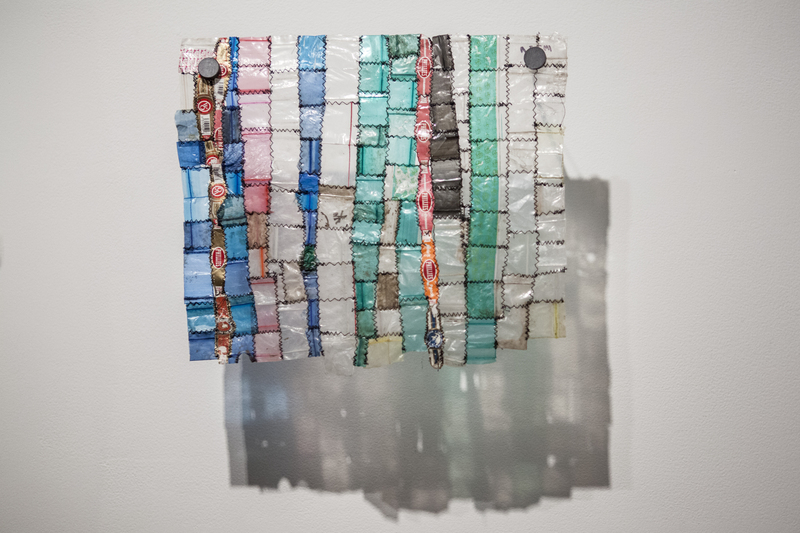 In the process of collecting materials, he discovered that different places had different types of bags, which led to a series of “drug-bag” flags with a patterning that was becoming part of his artistic vocabulary. These “paintings” are colorful compositions, harmonious in their appearance and in the combination of the dowels. He achieves sublime results with these products of daily use, where the colors and shapes of the bags are connected to the alternative mental states of drug consumption. Other works are made of cigarette papers, playing cards, bottle caps, and other waste materials, with an emphasis on transparency and lightness. Drapes of malaise, maps of the most extreme consumerism, and at the same time a reminder of family, folklore, and the human needs for security and stability, Fruin’s works also evoke the imagery of mass media: blurred, pixelated, digitized. We can recognize a certain quality of pop art, albeit re-conceptualized due to the recycling of materials from our consumerist society. His works interpret the psychological distress that originates from the more and more impersonal social environment, founded on individualism rather than on a collective consciousness. 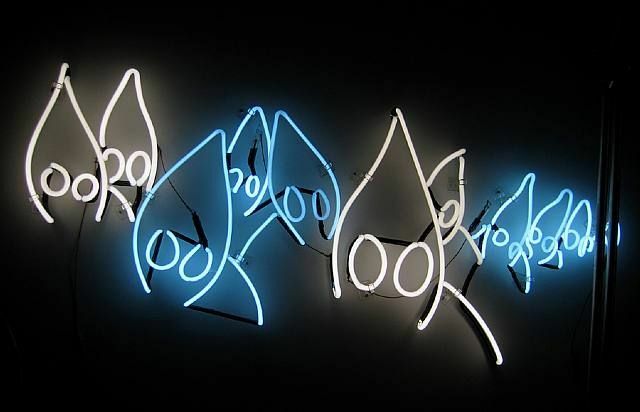 The reference to advertising is evident in his neon works—visual statements that denounce the negative aspects of American history. In recent years, Fruin has refined his technique of assembling and has “raised” the work from the wall into the three-dimensional realm, building large-scale sculptures composed of glass scraps, plexiglass, and acrylite, all of which have been recycled. “Materials with an experience enrich the work, always lending another angle to read the work from,” says Fruin. One of his major works is Watertower, which plays off of this characteristic architectural element that governs the rooftops of New York. In addition to being a monumental installation, the work serves as a guiding light in the huge metropolis. The light of the sun pierces the tinted windows, which reflect the light onto the ground in the surrounding environment. The installation changes with the passing of the day, marking changes in the intensity of the light and variations in the weather. Maxikiosko and Obelisk work in a similar way. Built and exhibited in Buenos Aires, made of the same colored tiles, they transform the sun’s rays into shining particles in a suggestive game of transparency. Both the obelisk and the house represent a “monument against the light” in a non-lieux (Marc Auge) and give a new identity to an anonymous space. The viewer is attracted and invited to interact with the reflected light, with the work itself, and with the surrounding space. Fruin acts like an archaeologist of the contemporary age. He uses fragile “relics” to give birth to a new universe where the viewer can become part of the experiment and transform painful origins into a positive personal experience. With an almost Socratic approach, he transforms existing splinters into luminous art installations, full of contemporary meanings without forgetting the past. The colored panels, resembling the stained glass windows of a church, lavish the artworks with a dignified, spiritual appearance. This stands in contrast to the cold, industrial architectural environments in which the works are often placed, where their functional form puts further emphasis on its magical aesthetics. The reflection and projection of colored light soften the hard and hostile urban space. The works become points of reference, contemporary lighthouses in the bustling metropolis. 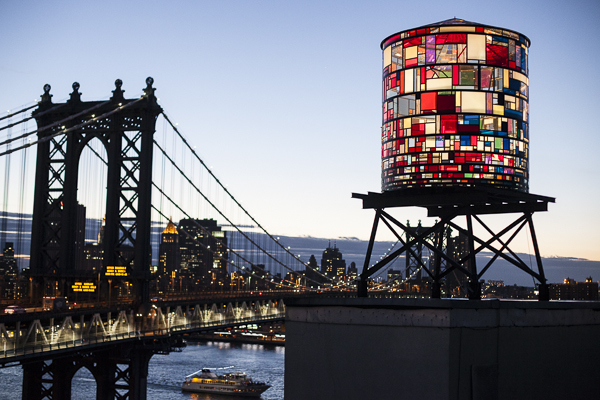 But unlike a classic lighthouse, which turns off at sunrise, Tom Fruin’s works light up with the onset of day. They animate and enliven the public space and open up new crystalline horizons. ← Dustin Yellin / Pioneer Works / New York.